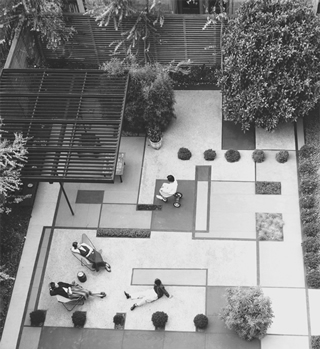 Striking Mondrian shapes form Royston's Chinn Garden design, San Francisco (photo from 1955). It’s not surprising that Bob Royston (1918-2008), playful guy that he was, is best known today for his parks. Like his residential gardens, they are freeform compositions of circles, ovals, and diagonals that look great in aerial view but, more importantly, provide a succession of pleasant and often exciting spaces and experiences to the user. 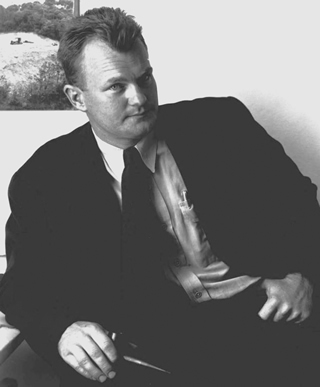 Royston studied at UC Berkeley and worked for Church in the late 1930s. He was offered a partnership after returning from Naval service in the Pacific, but turned it down to form a firm with Garrett Eckbo, who was less established than Church. “Garrett always attracted me because he’s a clear and social thinker, and he can really see the whole picture,” Royston said. Their firm, Eckbo, Royston and Williams, had branches in Northern and Southern California, with Royston running the San Francisco office. An early, formative project was Ladera, a housing cooperative in Portola Valley that Eichler took over after the co-op went bust. Royston laid out the hillside streets. After Eckbo and Royston split, Royston founded a firm that remains in business today. Royston designed his residential gardens as extensions of the house, often working with the architect, treating home and garden as equally important areas for living. “If there is a Bay Area style, it is to make the transition between the building and nature as quickly as possible, by actual line, form, and space,” he wrote. And, like several of his modern compatriots, Royston was “not a great plants person,” as he put it. He used plantings sparingly, more to define space and provide color and form, than for their value as horticultural specimens. Royston signatures include brick patios that blend with the landscape by allowing patches of plants to burst through. The edges of his patios and decks are often jagged, both to blend with planted areas and to set them off.